Over 75,000 visitors have enjoyed the observatory since 1999. We invite you to explore the universe with us! Start with a Public Star Night – no reservation needed! Join us on the third Friday of each month (except July) for a fascinating presentation and a guided tour of the heavens. We have a different speaker each month, and an ever changing array of planets, stars, and other celestial objects to observe. Doors open at 7:00 pm, and the program begins at 7:30. Public Star Nights provide an easy way to explore what LTO has to offer – just show up and have fun! Following the presentation, weather permitting, our large telescopes will be available for viewing. Look for details on the upcoming presentation in your local newspaper or on our Calendar. We are available for reservations 5 days a week, August through June, and offer scheduled sessions where you can learn about various astronomical topics and take a guided tour of the skies using the large telescopes in our observatory. We are closed the entire month of July for maintenance. Science classes, company parties, church groups, scout troops, individuals – anyone can schedule an event at the Little Thompson Observatory. A reservation for your group gives you access to the 6, 18, and 24 inch telescopes and other LTO resources. One or more volunteers will be available to help acquaint you with the night sky and to operate the telescopes. Every effort will be made to ensure that your visit will be a memorable one. In the event of inclement weather (clouds, snow, rain), we have a variety of presentations and movies, and can teach your group about the Constellation Wall. We can also demonstrate the telescope with the dome closed. There is never a charge for any of our programs, but we gratefully accept donations to help us continue this unique service. To reserve a date, go to our Reservation and Event Calendar page, find an open time and day, then fill out the form provided below the calendar. We may, from time to time, book multiple appointments during the same time slot, but will so indicate on the calendar. All days without a visible status are available for reservation requests. To see if a desired date has a group scheduled in the morning, simply click on the date and a pop-up window will provide details. If there is a morning group, you can still request an evening appointment on the same day. Please allow at least one week to get the appropriate volunteers scheduled for your visit. If you want to visit us in daytime, please give us two weeks prior notice to schedule your visit. Groups larger than 30 require special consideration. The Little Thompson Science Foundation reserves the right to refuse observatory access to anyone. The High School teaches an Astronomy Class on Mondays from 6pm -10pm at LTO during the school year. If you absolutely need to visit us on a Monday, you may not be the only group at the observatory that evening. Otherwise, select a different date. We are closed for annual maintenance the entire month of July. To insure the safety of our visitors, no events will be scheduled during July. Observing the following guidelines will help ensure that everyone has an enjoyable evening at the Little Thompson Observatory. We thank you for your cooperation. Park in the large, lighted high school parking lot. Parking is very limited near the observatory building. Dress according to the prevailing outside temperatures. While the main room at the observatory is heated, the telescope is maintained at outside temperatures for technical reasons. Bring a small flashlight, because the path to and from the observatory is not brightly lit. Listen to the presentation, ask a lot of questions, and enjoy yourself – it is your evening at the observatory! Our volunteers will do whatever is possible to make it an unforgettable experience for you. Co-operate in keeping the facility clean and orderly, your help is most appreciated. Bring food or drinks into the observatory unless specifically approved in advance. Bottled water is available at the observatory for a small donation. Bring your pet. Except service dogs, animals are not permitted. Bring bicycles, skateboards or in-line skates inside the observatory building. Use your cell phone while up in the dome. If you must take a call or send a message, please go down to the warm room. Lighted cell phones cause problems with night vision and distract from the viewing experience. Touch or lean on the constellation wall. We know it’s tempting but just look – don’t touch. Unlike the real ones, our stars are easy to knock out of their constellations. Take I-25 north to the Berthoud exit (exit number 250, for Highway 56), and go west into Berthoud. At the roundabout, continue west onto Mountain Ave (old Highway 287) where it is running east-west. Watch for 8th Street — there is a traffic light and Guarantee Bank and A&W at the intersection of Mountain Ave and 8th. Turn south onto 8th St. Follow 8th St. to the south; it meanders a bit. 8th Street ends in a T-intersection at Spartan Drive. Turn right (west) on Spartan Drive, and watch for Berthoud High School on your right. You’ll see the observatory to the north-east of the school, beyond the parking lot. Look for a blue building with 2 big white domes. Take Highway 287 (Main St. in Longmont) north to Berthoud, turn right towards Berthoud at the CO-56 interchange traffic lights West of Berthoud, follow CO-56 to the next lights and turn South (right) onto CR-17. Turn left on the 3rd street on your left, which is Spartan Avenue. The High School will be on your left and you can park in the parking lot just East of the school. 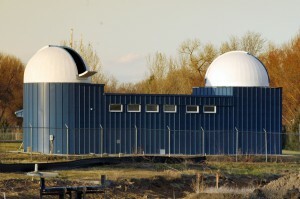 The Observatory is visible from the parking lot. Take Taft south to Berthoud, and go straight across old 287 at the traffic lights West of Berthoud and turn left on Spartan Avenue. The High School will be on your left and you can park in the parking lot just East of the school. Take Highway 287 south to Berthoud. Turn left (East) onto CO-56 at the traffic lights. Follow CO-56 East to the next lights and turn South (right) onto CR-17. Turn left on the 3rd street on your left, which is Spartan Avenue. The High School will be on your left and you can park in the parking lot just East of the school. The Observatory is visible from the parking lot. Take I-25 south to the Berthoud exit (exit number 250, for Highway 56), and go west into Berthoud. At the roundabout, continue west onto Mountain Ave. Watch for 8th Street– there is a traffic light and Guarantee Bank and A&W at the intersection of Mountain Ave and 8th. Turn south onto 8th St. Follow 8th St. to the south, and it meanders a bit. 8th will end in a T-intersection at Spartan Drive. Turn right (west) on Spartan Drive, and watch for Berthoud High School on your right. You’ll see the observatory to the north-east of the school. It’s hard to miss: a blue building with two big white domes. In most cases, darker blue boxes indicate better observing conditions in an hour’s column (note 24-hr clock format). Temperature and Humidity are exceptions. Temperature ranges from red (hot) to blue (frigid); white is around freezing (32°). Higher Humidity is shown in shades of yellow, orange and red.